Samantha Dewhurst is keen horse rider and has been riding since the age of seven but these days she is in the great news due to her advanced hair loss treatment. Samantha has become the first women in the UK, who received Robotic hair transplant at the age of 25. This reality star was suffering from a receding hairline problem as she explained that her tight hairstyle and helmet which she uses to wear while horse riding she was losing her hair from the front area of the head. She noticed that her hairline was moving back due to scraping her locks back in the helmet. This hair loss was the big concern for her so she decided to get the hair transplant. 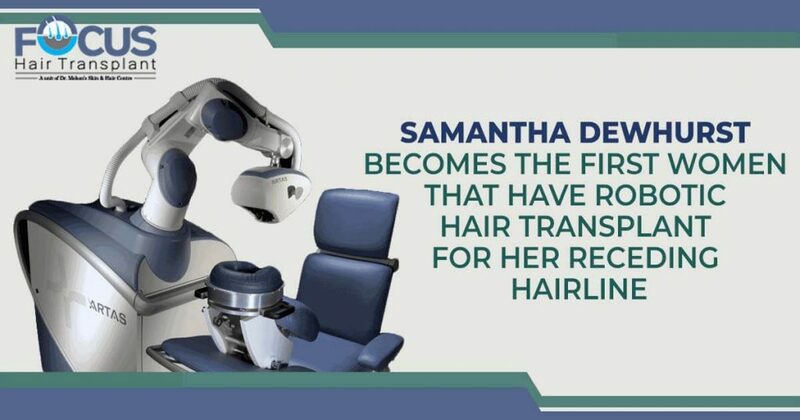 As Samantha was aware of the great revolutions of hair treatments so she decided to have the robotic hair transplant to get rid of her receding hairline which was hampering her image and personality. However the costing of this hair transplant was £6,000, but she is delighted and satisfied with the results of this advanced treatment. What is robotic hair transplant and how it works? Hair loss treatments have come long-long way in few years and this long journey of the hair loss treatments have blessed the hair loss patients with better results of treatment in the shorter period of recovery and hospital stay. Robotic hair transplantation is also the result of the long journey of hair treatments as with this treatment patients can get better results without complications and side effects. This new technique that has been practiced in the UK relies on the precision focused technology. This technology helps to select the best quality hair follicles to cover the thinning or bald areas of the scalp. Specialist and experienced surgeon after the harvesting of donor follicles with this advanced technology, implant the donor follicles in balding area. The robotic surgery starts with the designing and mapping of the balding area which is done by the specialist surgeon with his artistic approach and advanced technology so that originality of hair can be locked. The robotic system assists the surgeon in the implantation of new hair in balding or thinning areas preventing any damage to existing healthy permanent hair follicles around. So the Robotic hair transplantation is the advanced procedure that ensures the more accurate, faster and painless hair transplantation than the regular transplantation surgeries. However, this procedure is also done under local anesthesia like the regular hair transplantation procedures and even the recovery and aftercare instructions are also same for this advanced procedure but the patient gets recover faster after robotic transplantation as it is the least invasive procedure to restore young hairy look with great confidence and undetectable results.